'Lawrence of Arabia' commissioned Bartholomew to produce a map for his First World War memoir, 'Seven Pillars of Wisdom' (1926). This book, based on T E Lawrence's army years in the Middle East, became a great classic. Bartholomew's map shows the route of Lawrence's 600-mile march across the Arabian desert between May and June 1917. This march was part of a joint action with irregular Arab forces against the strategically-located port city of Aqaba. Lawrence's journey began at the Red Sea town of Wajh and continued on, via Wadi Sirhan in the north, to Aqaba. Interestingly, the map has wrongly influenced our understanding of Lawrence's exact route through Arabia. Bartholomew based the map on British War Office mapping of the area, which is today part of Saudi Arabia and Jordan. It was the best mapping available at the time. However, later mapping shows that Bartholomew's map was incorrect by over 30 miles. 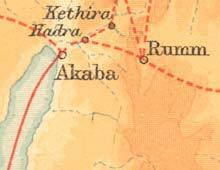 Later editions of 'Seven Pillars' continued to use Bartholomew's map as a basis for the army's route across the desert. This is despite the availability of superior topographic information. It seems to reflect a high level of trust in Bartholomew and Lawrence in the original map and the route shown. T E Lawrence wrote to D G Hogarth, President of the Royal Geographical Society, on 2 April 1926, requesting his advice for a good cartographer. 'If you can get me an address of a really good firm I'll write to them and explain myself. Not a big job. 300 names. 400 copies. A good draughtsman. A printer.' Bartholomew received the order on 6 July. Years later John 'Ian' Bartholomew remembered a particularly exciting event. On 22 August 1926, Lawrence of Arabia arrived unexpectedly by motorbike to request alterations to the printing of the map. By 1 October, 435 copies of the map were ready. They were then bound into the first Subscribers' Edition of the 'Seven Pillars of Wisdom'. A letter in the Bartholomew Archive thanks Lawrence for his £65 payment and his 'kind remarks' on the map. The Bartholomew map appears in a Japanese translation of 'The Seven Pillars of Wisdom' (2009). We were pleased to collaborate on this project, and have a copy of the translated book in our collections. One of those who worked on this new edition is researcher and translator Yagitani Ryoko. We have based this highlights page on her detailed research. Read more about Lawrence's route and the way it was mapped on Yagitani Ryoko's web page.